The Copenhagen Climate Talks are the world’s last chance to secure an emissions reductions agreement that will replace the Kyoto Protocol before it expires. There is growing consensus among scientists that we have as little as ten years to stop and reverse the global growth in greenhouse gas emissions before ‘runaway’ climate change becomes uncontrollable. That means the international talks being held in Copenhagen in December 2009 could be our last chance to avert a global catastrophe of unimaginable proportions – perhaps the most important international meeting ever held. 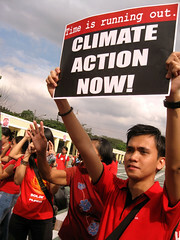 As part of the overwhelming need to demonstrate a global will for urgent and effective action at this decisive time in human history hundreds climate and justice activists in the Philippines underscored the urgency of action needed from our world leaders to push the Earth in the right direction. As we wait along with the rest of the world wait for the outcome of the talks in Copenhagen we hope that world leaders will head the clamor of the many and respond to the deafening sound of the global call for a fair, ambitious and legally binding climate deal.